Unprecedented declines in invasive breast cancer rates occurred in the United States between 2001 and 2004, particularly for estrogen receptor-positive tumors among non-Hispanic white women over 50 years. To understand the broader public health import of these reductions among previously unstudied populations, we utilized the largest available US cancer registry resource to describe age-adjusted invasive and in situ breast cancer incidence trends for non-Hispanic white women aged 50 to 74 years overall and by county-level rural/urban and poverty status. We obtained invasive and in situ breast cancer incidence data for the years 1997 to 2004 from 29 population-based cancer registries participating in the North American Association of Central Cancer Registries resource. Annual age-adjusted rates were examined overall and by rural/urban and poverty of patients' counties of residence at diagnosis. Joinpoint regression was used to assess trends by annual quarter of diagnosis. Between 2001 and 2004, overall invasive breast cancer incidence fell 13.2%, with greater reductions among women living in urban (-13.8%) versus rural (-7.5%) and low- (-13.0%) or middle- (-13.8%) versus high- (-9.6%) poverty counties. Most incidence rates peaked around 1999 then declined after second quarter 2002, although in rural counties, rates decreased monotonically after 1999. Similar but more attenuated patterns were seen for in situ cancers. Breast cancer rates fell more substantially in urban and low-poverty, affluent counties than in rural or high-poverty counties. These patterns likely reflect a major influence of reductions in hormone therapy use after July 2002 but cannot exclude possible effects due to screening patterns, particularly among rural populations where hormone therapy use was probably less prevalent. Between 2001 and 2004, incidence rates of invasive breast cancer declined more than 8% in the United States (US), with the greatest drops observed for estrogen receptor-positive (ER+) tumors among women aged 50 years and over [1–8]. Given that breast cancer incidence had increased continuously since at least the mid-1930s , there has been great scientific and public interest in explaining these declines, with the following main hypotheses set forth: (1) widespread discontinuation of and/or failure to initiate postmenopausal estrogen/progestin hormone therapy (HT) after the early termination of the Women's Health Initiative (WHI) HT trial in July 2002, a change which would lower incidence by decreasing the prevalence of a presumed occult tumor promoter [1, 2, 5, 8, 10–15]; (2) the saturation of mammographic screening programs between 1998 and 2000, as a consequence of reductions in the pool of previously unscreened women, which would also lower incidence [2, 7, 16, 17]; (3) an acute drop in the number of women receiving mammograms after 2001, thereby decreasing detection of early stage tumors to again result in lower incidence [16–19]; and (4) a combination of (1) to (3). These hypotheses have been discussed in relation to incidence rates over the past three decades [2, 7] and in the context of uniformly screened populations , but the degree to which each influenced recent trends still remains unclear. Since the US does not utilize any comprehensive, linked health-tracking databases, distinguishing among these explanations in an attempt to better inform breast cancer prevention strategies necessarily requires detailed assessment of population-based data by patient demographic and tumor characteristics. Using the National Cancer Institute's Surveillance Epidemiology and End Results (SEER) resource, we and others [1, 2] have found that the incidence reductions were most pronounced for hormone receptor-positive tumors among non-Hispanic white women over 50 years of age but were virtually absent among African-American and women under 50 years at diagnosis [5, 20]. These data underscore the clear variation in post-WHI incidence trends according to racial/ethnic-, age-, and tumor characteristic-defined subgroups and generally support the argument that recent breast cancer declines stemmed largely from mass HT discontinuation/non-initiation after second quarter (Q2) 2002 [1, 5–7, 21]. If declines did in fact result largely from changes in HT, then it is likely that incidence rates also vary by rural/urban and poverty status, because HT users were more likely to have higher education and lower poverty status than non-HT users . To our knowledge, no studies have yet described incidence changes in US regions outside the SEER program, which are important for understanding how rate changes may have affected populations other than those living in the disproportionately urban areas included in SEER . To this end, we took advantage of the North American Association of Central Cancer Registries (NAACCR) database, the largest US resource allowing for description by annual quarter of diagnosis and area-based measures of urbanicity and poverty, to determine how recent incidence changes affected these communities. With these data, we described age-adjusted invasive and in situ breast cancer incidence trends overall and by county-level measures of rural/urban and poverty status. We obtained all breast cancer incidence data from NAACCR's research file (Cancer in North America [CINA] Deluxe for NHIAv2 Origin) for 475,523 cases of invasive and 111,885 cases of in situ breast cancer (International Classification of Disease for Oncology, 3 rd Edition [ICD-O-3], sites 50.0–50.9) diagnosed between 1997 and 2004 and reported to 29 population-based cancer registries. These registries (Alaska; Atlanta, GA; California; Colorado; Connecticut; Detroit, MI; District of Columbia; Florida; Hawaii; Idaho; Illinois; Iowa; Kentucky; Louisiana; Maine; Massachusetts; Montana; Nebraska; Nevada; New Jersey; New Mexico; New York; Ohio; Oregon; Pennsylvania; Rhode Island; South Carolina; Texas; Washington) were selected, because they (1) met rigorous NAACCR criteria for completeness and quality , (2) submitted data continuously during the period 1997 to 2004, and (3) actively consented to participate in this analysis. Their combined catchment areas represented approximately 69% of the total US population during the observation period. Reported rates were highest in Washington DC, California, and Hawaii and lowest in Kentucky, Louisiana, and Ohio. Population estimates, based on US Census data, were obtained for these regions from the National Cancer Institute. Because post-WHI breast cancer incidence trends have been shown to vary by patient race/ethnicity, age, invasiveness, and hormone receptor subtype [1–3, 5–7, 20] we limited analyses to non-Hispanic white (hereafter referred to as white) women aged 50 to 74 years. Women in this racial/ethnic age group were selected since they experienced larger incidence declines after 2002 [1, 2, 7] than women of other races/ethnicities and ages and are relatively homogenous with respect to menopausal status, HT use, regularity of mammographic screening, and other breast cancer risk factors (for example, familial risk) . We examined incidence rates separately for invasive and in situ breast tumors but could not assess trends by tumor hormone receptor or HER2/neu status, as this information was not collected by most participating registries. Rates were then stratified by two characteristics of patients' counties of residence at the time of diagnosis: rural/urban status and percentage of the population living under the federal poverty level (FPL). Rural/urban codes were assigned according to the 2003 US Department of Agriculture nine-point rural/urban codification scheme, which distinguishes counties by population size, degree of urbanization, and adjacency to a metropolitan area . We further categorized rural/urban status as: (1) urban (2003 rural/urban continuum codes 1, 2, 3: counties in metropolitan areas of 1 million population or more, counties in metro areas of 250,000 to 1 million population, counties in metro areas of fewer than 250,000 population); (2) suburban (2003 rural/urban continuum codes 4, 5, 6: urban population of 20,000 or more adjacent to a metropolitan area, urban population of 20,000 or more not adjacent to a metropolitan area, urban population of 2,500 to 19,999 adjacent to a metropolitan area); or (3) rural (2003 rural/urban continuum codes 7, 8, 9: urban population of 2,500 to 19,999 not adjacent to a metropolitan area, completely rural or less than 2,500 urban population adjacent to a metropolitan area, completely rural or less than 2,500 urban population not adjacent to a metropolitan area). Poverty was categorized into three levels: (1) low (<5.0% and 5.0 to 9.9% of population below FPL); (2) middle (10.0 to 19.9% of population below FPL); or (3) high (20.0+% of population below FPL). The percentage of the total county population below the FPL, obtained through linkage with the US Census Bureau , has been shown previously to correlate well with other measures of economic deprivation including educational attainment, unemployment rate, and occupational composition . A total of 137 cases of invasive and 37 cases of in situ breast cancer with unknown or missing counties of residence at diagnosis were excluded from these assessments. We used SEER*Stat version 6.3.6 (National Cancer Institute, Bethesda, MD, USA) to calculate annual and quarterly incidence rates per 100,000 person-years (unless otherwise noted) and corresponding 95% confidence intervals (CI). All rates were age-adjusted to the 2000 US standard and were compared statistically by calculating the difference between 2001 and 2004 rates, dividing by the standard error of the difference, and testing this number for a statistically significant difference from zero using the standard normal distribution . Tests of statistical significance assumed a two-sided P value of 0.05. To further characterize incidence patterns, we assessed quarterly rate trends using Joinpoint, version 3.0 (National Cancer Institute, Bethesda, MD, USA), which identifies significant changes in overall trends by fitting a series of linear regression functions based on a Monte Carlo permutation method . Quarterly, rather than annual, rates were subjected to Joinpoint analysis to provide more points for regression as well as to identify more precisely the timing of rate changes. All data were plotted on a semi-logarithmic scale to aid visual assessment of slope differences . NAACCR Institutional Review Board approved this project, and the Scientific Editorial Board approved the final manuscript. Table 1 shows characteristics of the study patients and their tumors. Higher proportions of women diagnosed with breast cancer resided in urban than rural and low- or middle- than high-poverty counties, irrespective of invasive status. Characteristics of invasive and in situ breast cancer cases among non-Hispanic white women aged 50 to 74 years, 1997 to 2004 (NAACCR, CINA Deluxe). Figure 1 documents incidence trends according to tumor invasive status. Overall patterns of invasive breast cancer were comparable among women living in both urban and suburban counties but differed for women in rural counties (Figure 2). Although well-differentiated in previous years, county poverty level-specific rates of invasive tumors converged after 2002 (Figure 3A). Breast cancer incidence among non-Hispanic white women aged 50 to 74 years by invasive status and year. (a) Trends for invasive breast cancer. (b) Trends for in situ breast cancer. All rates are age-adjusted to the 2000 US standard (NAACCR, CINA Deluxe). Breast cancer incidence among non-Hispanic white women aged 50 to 74 years by county rural/urban status and year. (a) Trends for invasive breast cancer. (b) Trends for in situ breast cancer. All rates are age-adjusted to the 2000 US standard (NAACCR, CINA Deluxe). Breast cancer incidence among non-Hispanic white women aged 50 to 74 years by county poverty level and year. (a) Trends for invasive breast cancer. (b) Trends for in situ breast cancer. All rates are age-adjusted to the 2000 US standard (NAACCR, CINA Deluxe). To be comparable with prior reports [1, 2, 20] describing rate drops between the years 2001 and 2004, we calculated absolute and relative incidence changes over this same time period (Table 2). For invasive cancers, overall rates fell 13.2%. Moreover, while rural and high poverty counties consistently reported lower incidence rates, changes were greater for urban (13.8%) and low (13.0%) or middle (13.8%) poverty counties. Most reductions were statistically significant (P < 0.05). Incidence of in situ cancers also declined by 4.8%. Absolute and relative percent changes in invasive and in situ breast cancer rates among non-Hispanic white women aged 50 to 74 years by county rural/urban and poverty status for the years 2001 and 2004 (NAACCR, CINA Deluxe). Joinpoint regression analysis by annual quarter of diagnosis allowed for more detailed investigation of recent breast cancer patterns (Table 3). Four trends were detected for all invasive tumors and among women living in urban, low-, and middle-poverty counties: an incidence increase, stabilization, sharp but statistically non-significant decrease, followed by a second stabilization. The most rapid declines in these groups occurred between Q2 2002 and Q1 2003, whereas more gradual decreases began between Q2 1998 and Q1 1999 among women living in rural and high-poverty counties. Results from Joinpoint regressions for invasive and in situ breast cancer among non-Hispanic white women aged 50 to 74 years by county rural/urban and poverty status, 1997 to 2004 (NAACCR, CINA Deluxe). Using the largest US population-based cancer incidence resource available, we observed that substantial reductions in invasive breast cancer during the period 2001 to 2004 were more pronounced for women living in urban and low-poverty compared with other areas. Breast cancer incidence trends for rural counties, which peaked in 1999 and then declined steadily, differed from those observed in urban counties, where rates fell most dramatically after 2002. Similar but more attenuated patterns were seen for in situ cancers. These data further inform the main hypotheses proposed thus far to explain recent breast cancer trends. 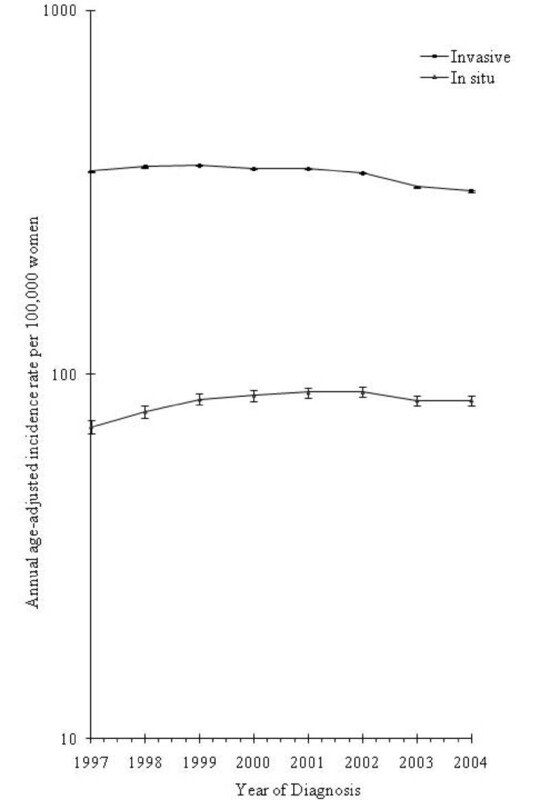 Proportionately larger incidence drops among women living in urban and suburban than rural counties are consistent with changing patterns of HT prevalence and cessation or non-initiation but cannot rule out a possible influence of mammography saturation in rural areas. Similar to prior reports [1, 2, 5–7], urban and suburban trends for invasive breast cancer track temporally to nationwide HT prescription patterns, which increased until 1999, peaking at 92 million prescriptions/year, then plateaued after the release of null results regarding cardioprotection from the Heart Estrogen/Progestin Replacement Study (HERS) and unfavorable preliminary findings from the WHI [10, 32–34]. Prevalence of HT plummeted by 37% to 72%, immediately following the highly publicized July 2002 termination of the WHI estrogen/progestin arm in which the experimental group was found to have higher risk of breast cancer than controls [10, 11, 13, 14, 32, 35]. Haas et al. reported that the number of newspaper articles about the harmful effects of HT found in the WHI trial correlated with urban residence and likelihood of HT cessation/non-initiation; women in urban areas (for example, San Francisco/Bay Area) were potentially exposed to more newspaper articles and had a larger decline in the prevalence of HT use than women in more rural areas (for example, Vermont and New Mexico) . Additionally, among white California Health Interview Survey (CHIS) respondents aged 50 to 74, current estrogen/progestin HT use dropped more than twice as much in urban versus rural counties between 2001 and 2003 (urban: 9.1% decline from 26.5% in 2001 to 17.4% in 2003; rural: 4.4% decline from 22.1% in 2001 to 17.7% in 2003) . Because current or recent HT use appears to increase risk of invasive but not in situ breast cancers [38, 39], the impact of widespread HT discontinuation/non-initiation should be more evident for invasive than in situ tumors, as observed in urban and suburban counties. 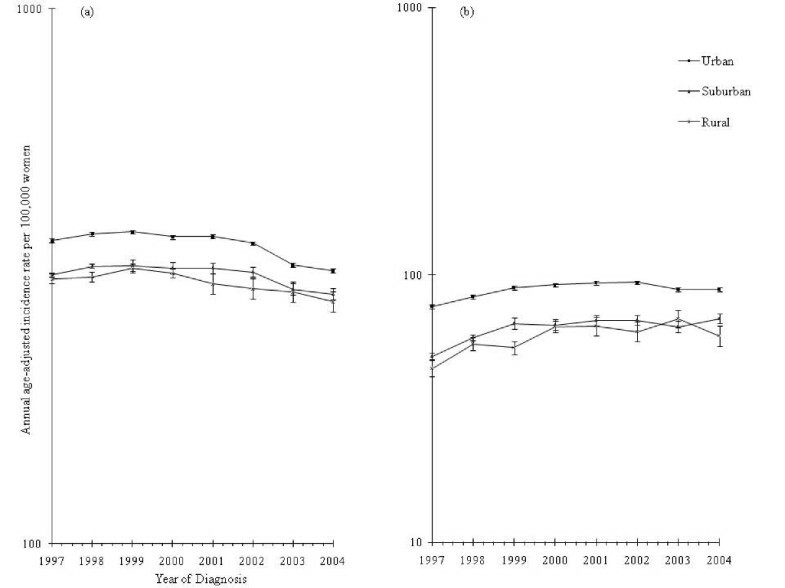 Thus, our assessment of annual and quarterly trends demonstrates that the sharpest declines in invasive tumor rates among populations with the largest proportions of former HT users coincided specifically with the WHI announcement in 2002 and provides additional evidence of the correlation between population HT patterns and population breast cancer patterns. Saturation of or decreases in mammographic screening would be expected to influence incidence trends for in situ tumors, which are not palpable and therefore, must be detected radiographically. In California, reductions in the proportions of women reporting biannual mammograms between 2001 and 2003 were apparent and slight in both urban and rural counties (urban: -1.4%, 86.1% in 2001 to 84.7% in 2003; rural: -0.6%, 84.1% in 2001 to 83.5% in 2003) . These changes do not seem large enough to explain entirely the breast cancer drops and did not occur selectively among former HT users, which hypothetically could cause disproportionately large incidence drops . More sustained declines in mammography could have impacted the rates among women living in rural counties, especially in light of their lower levels of HT utilization and the disparate drops in invasive relative to in situ breast cancer incidence observed here for rural versus urban/suburban populations. We did not observe major differences in invasive breast cancer incidence trends by poverty level, perhaps because the county-level measure did not differentiate breast cancer rates well among categories. Smaller area-level measures (for example, census tract) could not be used, since NAACCR's aggregated, multi-registry data file does not include incidence data for such geographic regions. Some authors have reported more modest socioeconomic gradients in breast cancer incidence among white than non-white women . Several studies have documented significant associations between HT use and individual-level markers of socioeconomic status such as education or personal income [22, 42, 43], but it remains unclear whether post-WHI HT utilization declined uniformly across all poverty levels. At least one study found equivalent drops , whereas California women with incomes 300% or more above the FPL reported considerably larger decreases in estrogen/progestin HT use (-9.8% decline from 29.6% in 2001 to 19.8% in 2003) than women below the FPL, among whom rates were stable (0.5% increase from 11.3% in 2001 to 11.8% in 2003) . Regardless, the absolute number of women who stopped or did not initiate HT after 2002 was more substantial for low- versus high-poverty populations, a fact which is likely related to the marked drops in breast cancer rates in those areas. 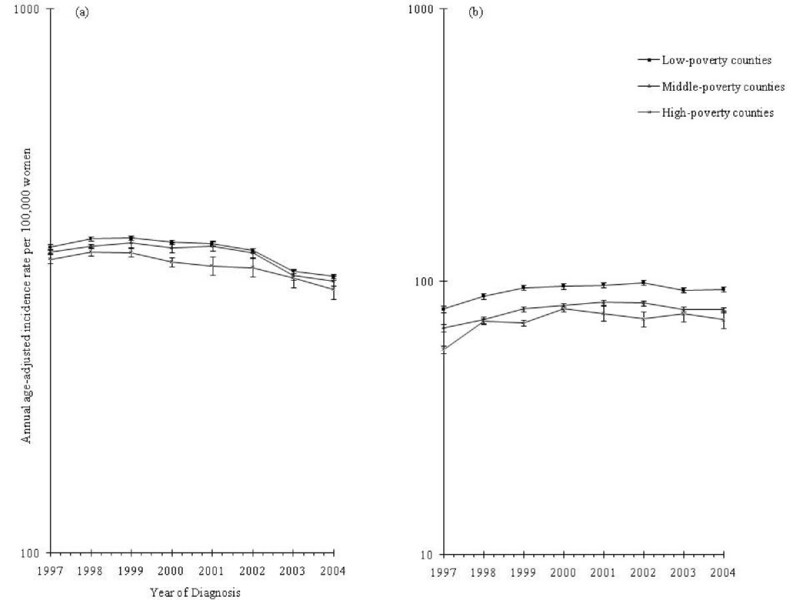 National mammographic screening patterns among white women aged 50 to 64 years were similar for all poverty levels with the percentage of screened women plateauing between 1998 and 1999 then declining after 2000 [16, 19, 37]. Other hypotheses set forth to explain breast cancer declines are incompatible with the trends reported in this analysis. Incidence reductions could have resulted from increases in the use of chemopreventive or other pharmaceuticals (for example, tamoxifen, raloxifene, nonsteroidal anti-inflammatory medications, and statins) thought to protect against breast cancer [1, 19, 44] or from changes in relevant lifestyle risk factors such as the percentage of overweight and obese individuals, number of alcoholic beverages consumed, or level of physical activity . Improved detection of in situ tumors over the last two decades could also cause decreases in invasive cancers, if in situ lesions are precursors of invasive disease [44, 46]. Nevertheless, because these processes are continuous and long-term [19, 44] they are unlikely to account for the rapid incidence drops seen over a two-year period in the early 2000s. Although this analysis employed data from the largest population-based cancer incidence resource in the US, including up to 60% more of the country's population than prior reports and allowing for evaluation of robust trends by annual quarter of diagnosis among multiple demographic groups, it has several important limitations. First, cancer registries generally do not collect individual-level socioeconomic information, which would supplement area-level data to help interpret trends by rural/urban and poverty status. Prior studies suggest that area-level patterns are generally consistent with but underestimate individual-level trends and more accurately reflect economic deprivation of a geographic region than of an individual. These two characteristics may be linked to one another, as residents of high-poverty areas are more likely to be poor or vice versa [27, 28, 47–50]. Area measures were only available at the county level and not for smaller, possibly more homogeneous, geographic designations. The size of counties varies considerably across the US . To better understand the impact of including large counties for which area categorizations likely represented average values, we repeated analyses to exclude 21 US counties with 2000 Census populations of white women exceeding 1 million but saw no substantial change in observed trends (data not shown). Second, incidence rates were not adjusted for possible delays in reporting. However, a recent analysis by Jemal et al. found that such adjustments had little effect on breast cancer declines or other patterns . Third, we were unable to stratify rates by gene expression-defined subtypes (for example, basal-like, luminal A) or hormone receptor status  because these characteristics are not available in the NAACCR database. Approximately 50 to 60% of all breast cancers are estimated to be hormone receptor-positive, and 30 to 35% receptor-negative . Considering that the recent declines were most marked for hormone receptor-positive cancers, it is likely that regional differences would be greater for these subtypes. Finally, the detailed county-level HT and mammography utilization data used to help contextualize some of our findings were available for only California and not women nationwide; this information may not be representative of our entire study population, particularly with respect to rural and high-poverty groups. Our findings that US breast cancer incidence rate declines among white women aged 50 to 74 years were more pronounced for invasive than in situ tumors in urban and low-poverty compared with rural and high-poverty counties are consistent with prior analyses confirming heterogeneity in breast cancer trends by age, race/ethnicity, and tumor subtype [1–3, 6, 7]. These results further support an influence of population-level HT utilization patterns on population-level breast cancer incidence patterns. Identifying the specific subgroups most affected by the natural experiment that occurred when US women stopped HT en masse in 2002 remains important for understanding the future burden of breast cancer in populations relevant to epidemiology and health planning. Future investigations should seek to clarify further the possible impact of mammographic screening changes or other factors on recent breast cancer incidence, as this study was unable to rule them out. AKH would like to thank C-Change for its contributions to this study. The analyzed data were obtained from NAACCR and submitted to NAACCR as of December 2007. Support for cancer registries generally is provided by the state, with additional support from the Centers for Disease Control and Prevention's National Program of Cancer Registries (NPCR) and for some registries, the National Cancer Institute's SEER Program. This analysis was supported in part by the SEER program under contract N01-PC-35136, which was awarded to the Northern California Cancer Center. The ideas and opinions expressed herein are those of the authors, and endorsement by the state of California, the National Cancer Institute, or the Centers for Disease Control and Prevention or their contractors and subcontractors is not intended nor should be inferred. CAC has served as an expert witness for the plaintiffs in hormone therapy litigation. The other authors declare that they have no competing interests. AKH and CAC conceived of the study, performed the statistical analysis, interpreted the data, and drafted the manuscript. THMK, ETC, SLG, and HH participated in critical revisions of the manuscript. All authors read and approved the final manuscript.